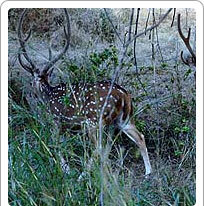 Akal Wood Fossil Park Is An Important Destination Because Of Fossil Remains From Jurassic Era, 130 Million Years Back. Beyond history and royalty of Rajasthan, witness the evolution of the Earth with fossilised remains of a forest from the Jurassic era. Situated a mere eighteen km from the centre of Jaisalmer city, it is easily accessible by taxis and auto rickshaws. The forest at this location was submerged in the sea. Fossilised trees and sea shells are scattered around in their natural position, in this wondrous place spread over twenty-one hectares. There are more fossils lying under the surface that are excavated through ongoing activities. In the Jurassic era there were no flowering plants and trees. The fossils that are present here are considered to be the precursors of gymnosperm trees like Chir, Deodar and Redwood. From the presence of these trees, it has been deduced that the land that is a desert today was once hot and humid and was overflowing with greenery. The Akal Wood Fossil Park attracts not just tourists but also geologists and conservationists from across the globe. Entry fees of Rs.20 for foreigners, Rs. 5 for Indians and Rs 10 for vehicle are levied at the park.